The room was a pleasant surprise, as the lobby and exterior did not suggest that renovations had been recently done. It seemed like the bathroom was completely redone, with modern fixtures all around, and the room itself was finished quite well with extensive recessed lighting. Everything expected was available and worked (eg. wifi, safe, water, working A/C, plentiful electrical outlets, etc.). Great location and would probably stay here again. The staff cheated us with showing us a room and then after the payment they took us to a different room and didn't agree to fix it. The bellboy kicked my bag down the stairs when we left because he was angry that he needed to turn off his cigarette. And MANY MANY ants. MANY. 0 help from reception. Never go there again. This hotel is very conveniently located just off of Ben Tahn Market. There are plenty of places to eat and drink around and also lots of tourist attractions within a 10-15 minute walk away. The hotel staff are friendly and helpful. We didn't have breakfast so cannot comment on that. The hotel itself is comfortable with a safety deposit box, hairdryer, mini bar and tea & coffee making facilities within the rooms. The showers are powerful however if they are all like the one we had in our room, they're very small and I'm not sure anyone over 6ft would fit in them. The WIFI wasn't great, but overall I would stay here again. We stayed one night and found the staff to be very friendly and helpful. They kept our luggage safe while we walked around the city, waiting to check in. Room was very tidy and organized and looked exactly like the photos posted. The location was amazing as it was a few minutes walk away from shopping centres and tourist sites. Found this hotel stay to be very good value. The only complaint was that the wifi connection was a bit slow for us. If you are just interested in staying in a central location for a reasonable place, stay in this hotel. If you are looking for things like good service, nice breakfast or a big and comfi room, this is not your place. Personally, I wouldnt reccomend this hotel. Located right in the heart of district 1, right in the area of the Night Market . Small , but comfortable room . Recommended . Free breakfast was basically cooked for us , not many guests were at hotel at the time of our visit . We stayed here at the end of our Vietnam trip for 6 nights. It was in a good location, we could walk to the market and to restaurants and bars. The room was quite small but kept nice and clean. The aircon was good. The only problem was the damp smell from the bathroom, but this could be kept away if the fan was on all of the time. The reception staff were great and helped us to print our flight tickets for our next destination. Nice little hotel, rooms are only small. We've been traveling for 3 months an we have seen some awful showers that sometimes don't even have clean warm water, so this bathroom was just incredible for the money. The shower was amazing, all brand new with several shower jets. Convenient location, very close to shopping centres an restaurants. Staff are also really friendly, would defiantly stay here again. Haggle on the price, we paid $21. We arrived in Ho Chi city after a long coach journey from Cambodia so this hotel really comforted our needs. The staff and very helpful and friendly. I think this hotel is at a reasonable price. The room was perfect, very clean a bit on the small side but that's ok. The shower was wonderful (jet shower) and the bed is very comfortable. If you are stopping in Ho Chi Minh City and want a comfy nights sleep then stay here! 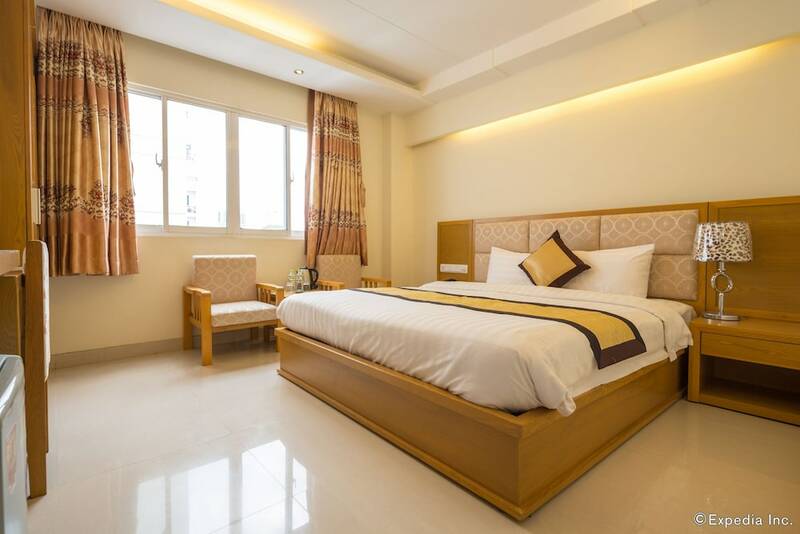 Located in Downtown Ho Chi Minh City, Vuong Tai Hotel is next to popular attractions like Saigon Square and Ben Thanh Market. This 20-room hotel has in-room conveniences like refrigerators, minibars, and LCD TVs. Enjoy a bite to eat at Vuong Tai Restaurant, the hotel's onsite restaurant. Guests can expect to find free WiFi and 32-inch an LCD TV with cable channels. The bathroom offers hair dryers and free toiletries. Other standard amenities include a refrigerator, a minibar, and free bottled water. Vuong Tai Hotel features free WiFi in public areas and a porter/bellhop. Airport transportation is made easy with an airport shuttle (available 24 hours) for VND 700000 per vehicle one-way. Multilingual staff at the front desk are standing by 24/7 to help with luggage storage, dry cleaning/laundry, and tours or tickets. Vuong Tai Restaurant - Restaurant. The preferred airport is Ho Chi Minh City (SGN-Tan Son Nhat Intl. ): 25-min drive, 4.4 mi/7.1 km. The front desk is open 24 hours a day. For convenient arrivals and departures, you can take advantage of the airport shuttle (available 24 hours), which is offered for a fee. This hotel provides transfers from the airport (fees apply). To make arrangements, contact the property with arrival details 48 hours prior to arrival, using the phone number on your booking confirmation.